Florida consists of diverse growing climates. While South Florida enjoys subtropical weather, North Florida experiences hot summers and colder winters. Central Florida offers mild winters, but hotter summers. Florida falls under U.S. Department of Agriculture Hardiness Zones 8 to 11. Florida gardeners should select plants according to the appropriate zone, bloom color, bloom time and intended use. Many shrubs with white flowers thrive in Florida gardens. The button bush (Cephalanthus occidentalis), also called the button willow and the honey bells bush, belongs to the madder plant family (Rubiaceae) and thrives along Florida’s marshes and swamps. Small, white flowers bloom in June. The fragrant blossoms smell like honey and attract numerous bees and butterflies. Mature button bushes reach 5 to 12 feet tall with a spread of 4 to 8 feet. The button bush prefers continuously moist soil in full sun. Florida gardeners typically plant button bushes along streams and ponds. Walter’s viburnum (Viburnum obovatum), a shrub belonging to the honeysuckle family (Caprifoliaceae), thrives in Florida’s swamp margins and thickets. This perennial shrub features fuzzy red twigs and white flower clusters. These flowers bloom from February to April, followed by red fruits that ripen to black. Sometimes called small-leaf arrowwood, the mature plants reach up to 18 feet high. This plant prefers moist soils in partly shady locations. Gardeners often plant Walter’s viburnum as screens or formal hedges. Inkberry (Ilex glabra), also called gallberry, belongs to the Aquifoliaceae plant family. Mature inkberry shrubs reach up to 8 feet in both height and spread. Small, white flowers bloom in May and June, followed by green fruit that ripens to black. Naturally occurring in Florida’s pine flatwoods, this plant prefers wet, peaty soils in partly to fully sunny locations. Spider mites often feed on the foliage. Florida gardeners typically use inkberry shrubs as informal hedges, foundation plants and shrub borders. The butterfly bush (Buddleia officinalis), also called the summer lilac, belongs in the Buddlejaceae family. This shrub remains semi-evergreen in Florida’s mild winters. Mature butterfly bushes range from 6 to 12 feet tall with a spread of 4 to 15 feet. Butterfly bushes feature grayish-green leaves and small clusters of white flowers with bright orange throats. These fragrant flowers attract butterflies. 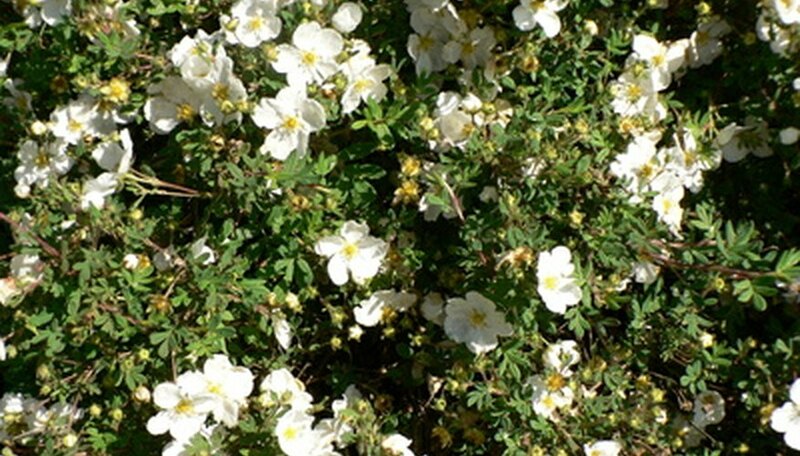 This shrub prefers dryer, well-drained soils in part shade to full sun positions. Gardeners often use these plants in butterfly gardens. The clerodendrum shrub (Clerodendrum trichotomum), a member of the Verbenaceae plant family, naturally occurs in Japan and typically performs well in Florida gardens. Mature shrubs grow between 10 and 20 feet tall with similar spreads. Fragrant, white flowers bloom from July through September, giving way to tiny blue fruit. The aromatic leaves smell similar to peanut butter when crushed or bruised. This shrub thrives in well-drained soils that receive partial to full sun. Florida gardeners often use the clerodendrum in woodland margins and shrub borders.